The Schöningen spears are a set of eight wooden throwing spears from the Palaeolithic Age that were excavated between 1994 and 1998 in the open-cast lignite mine in Schöningen, Helmstedt district, Germany, together with an associated cache of approximately 16,000 animal bones. The excavations took place under the management of Hartmut Thieme of the Lower Saxony State Service for Cultural Heritage (NLD). Originally assessed as being between 380,000 and 400,000 years old, they represent the oldest completely preserved hunting weapons of prehistoric Europe so far discovered. As such they predate the age of Neanderthal Man (by convention taken to emerge after 300,000 years ago), and is associated with Homo heidelbergensis. The spears support the practice of hunting by archaic humans in Europe in the late Lower Paleolithic. The age of the spears was estimated from their stratigraphic position, "sandwiched between deposits of the Elsterian and Saalian glaciations, and situated within a well-studied sedimentary sequence.". More recently, thermoluminescence dating of heated flints in a deposit beneath that which contained the spears suggested that the spears were between 337,000 and 300,000 years old. 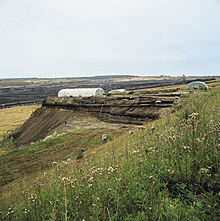 The site of the finds (Schöningen 13/II sedimentary sequence 4) is one of 13 Palaeolithic places of discovery in the open-cast, lignite mine (working area, south) that was excavated in the course of the prospection of the quaternary surface layer from 1992 to 2009. The 60 by 50 m (200 by 160 ft) excavation base that was excluded from coal mining represents a small segment of a former littoral zone. This zone has been visited over millennia, between the Elster- and Saale ice ages, by humans and animals alike. The pedestal displays five massive, layered sediment packages that were created by varying levels of the lake and silting-up processes. Thanks to the quick, airtight covering of the archaeological layers by mud, the organic materials are exceptionally well preserved. In the sequence of the sedimentary layers, climate changes can be read with a high resolution - from a warm, dry phase to airy deciduous forests to tundra. The spears themselves are from an approximately 10 m (32.81 ft) wide and 50 m (164.04 ft) long strip, parallel to the former lake shore in the sedimentary layer four, the late Holstein-interglacial. The archaeological layers beneath have only been partially excavated and have been an objective of a research excavation by the DFG (German Research Association) since 2010. Together with the spears, some stone artefacts, chips as well as over 10,000 animal bones were found, amongst them 90% horse bones, followed by red deer and European bison. The horse bones come from Equus mosbachensis and are indicative of at least 20 individuals. They show numerous cut marks made by stone tools, but only a few bite marks made by animals. The site is interpreted by the excavator Harald Thieme as testimony of a hunting event as well as the following cutting up and preparation of the kill. According to his scenario, the thick reeds at the lake shore gave the hunters cover, from where the horses, trapped between the hunters and the lake, were culled with accurate spear throws. Because there are bones of young animals amongst the horse bones, he concludes that the hunt took place in autumn. Furthermore, he sees evidence of ritualistic activity, because the spears were left behind. The spears, deformed by the load of the sediment pressure, are made from slim, straight spruce stems – except for spear IV which is made from pine wood. The spears vary in length from 1.82 to 2.25 m (5.97 to 7.38 ft), with diameters ranging from 29 to 47 mm (1.14 to 1.85 in). They have been worked very thoroughly and are evidence of highly developed technological skills and of a workmanlike tradition. [original research?] Like in today’s tournament javelins, the greatest diameter and therefore its centre of gravity is in the front third of the shaft. The tips are worked symmetrically from the base of the stems, and the end of the tips were worked beside the medullary ray, the weakest part of the stem, on purpose. In their throwing qualities, the Schöningen Spears are equal to modern tournament javelins. During tests, athletes could throw replicas up to 70 m (230 ft). The choice of the wood is likely to be climatically determined, because during the cooler climate near the end of the interglacial, conifers grew close to the site of the finds. 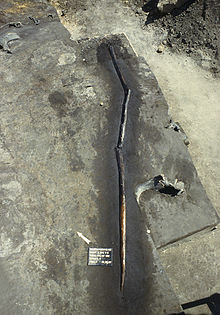 More unique wooden artefacts were found at the place of discovery of the wild horse hunting camp: a charred wooden staff (skewer) as well as a wooden tool, tapered at both ends, interpreted as a throwing stick. The stone tools at the place of discovery consist of different scraper-shaped and pointed forms. Evidence of blank production is missing; much retouched debris proves the reworking of the brought-along tools. Also among the finds are the so-called "grooved wooden tools", excavated at the place of discovery No. 12. Made from the extremely hard wooden branch-bases of the European silver fir, and noticeably incised at one end, they may have been used as a mounting for stone blades. If this interpretation is correct, they are the oldest composite tools of mankind. Thanks to the good preservation conditions at the place of discovery, there are many finds of small animals, among them small mammals, fish, molluscs and insects. Together with the carpological remains they make a detailed reconstruction of the climate and the environment of the passing of an interglacial period possible. The spears and the place of discovery have revolutionized the picture of the cultural and social development of early humans. Previously, the widespread opinion was that Homo heidelbergensis (and Neanderthals, regarded as a descendant of H. heidelbergensis) were simple beings without language that lived on plants and carrion. The spears and their correlated finds are evidence of complex technological skills and are the first obvious proof for an active (big game) hunt. It seems that H. heidelbergensis could hunt herd animals that can run faster than a human, and this suggests that they had sophisticated hunting strategies, a complex social structure and developed forms of communication (language ability). H. heidelbergensis therefore already had intellectual and cognitive skills like anticipatory planning, thinking, and acting, that up until then had only been attributed to modern humans. Since 2010, the excavations on top of the excavation base continued in the framework of a project by the Lower Saxony State Service for Cultural Heritage in Hannover and the Eberhard Karls University Tuebingen, Department of Early Prehistory and Quaternary Ecology of the Institute of Pre- and Protohistory and Mediaeval Archaeology, supported by the Deutsche Forschungsgemeinschaft (German Research Association). Numerous cooperation partners domestic and abroad are involved in the reprocessing and the evaluation of the excavations: Rijksuniversiteit Leiden (paleontology), Leuphana University Lueneburg (palynologie), Senckenberg Research Institute and Nature Museum in Frankfurt am Main, Leibniz University Hannover(geology), Institute for Quaternary Lumbers Langnau (wood anatomy), Romano-Germanic Central Museum Mainz and others. In 2009, Lower Saxony allocated public funds from the increased funds for the economy package II for the construction of a research and development centre. The centre, close to the place of discovery, is devoted to the inter-disciplinary research of the Schöningen places of discovery, as well as to the Pleistocene archaeology, and presents the original finds in an experience-orientated, modern exhibition. The transparent research and laboratory area as well as an interactive visitor’s laboratory link the areas “research” and “museum”. A 24 hectare outdoor area presents typical plant communities of the interglacial, among them a pasture for wild horses. The place has been planned as an extracurricular place of learning. The building contractor was the town of Schöningen. Responsible for the conception and contextual planning was the Lower Saxony State Service of Cultural Heritage. The centre was opened at the beginning of 2013. Archaeologists at the University of Tübingen have questioned some of the initial interpretations of the site. Isotope analysis and wear patterns on the horses' teeth show a wide variety of habitat and diet amongst the animals, indicating that the faunal assemblage accumulated in many small events, rather than one large slaughter. Sediment analysis shows that the red colour previously thought to be a result of hearths and burning are actually iron compounds forming as the lake levels dropped in recent times. Lake algae, sponges, and small crustaceans found in the sediments show that the spears were never on dry land and that the deposit has always been submerged. These data suggest that instead of representing a big hunting event, the spears suggest less social complexity than originally suggested. They also suggest that the horses were hunted in shallow water rather than at the lake edge. Wooden artifacts from the Palaeolithic age are very rarely delivered to posterity. Beside Schöningen, finds are the Clacton Spear from Clacton-on-Sea (England), Torralba (Spain), Ambrona (Spain) and Bad Cannstatt (Germany/Baden-Wuerttemberg), of which only the Clacton Spear has been preserved. The artificial character of calcified lumbers from the discovery site Bilzingsleben is debatable. A wooden stabbing lance from Lehringen, also from Lower Saxony, was found underneath the skeleton of a straight-tusked elephant and is aged approximately 125,000 years, so it is much younger. The elephant was possibly killed by it. ^ Hartmut Thieme, Reinhard Maier (Hrsg. ): Archäologische Ausgrabungen im Braunkohlentagebau Schöningen. Landkreis Helmstedt, Hannover 1995. ^ Hartmut Thieme: Die ältesten Speere der Welt – Fundplätze der frühen Altsteinzeit im Tagebau Schöningen. In: Archäologisches Nachrichtenblatt 10, 2005, S. 409-417. ^ Michael Baales, Olaf Jöris: Zur Altersstellung der Schöninger Speere. In: J. Burdukiewicz u. a. (Hrsg. ): Erkenntnisjäger. Kultur und Umwelt des frühen Menschen. Veröffentlichungen des Landesamtes für Archäologie Sachsen-Anhalt 57, 2003 (Festschrift Dietrich Mania), S. 281-288. ^ O. Jöris: Aus einer anderen Welt – Europa zur Zeit des Neandertalers. In: N. J. Conard u. a. (Hrsg. ): Vom Neandertaler zum modernen Menschen. Ausstellungskatalog Blaubeuren 2005, S. 47-70. ^ Thieme, H. 1997: Lower Paleolithic hunting spears from Germany. Nature 385(27), 807-810. ^ Richter, D. and M. Krbetschek. 2015: The age of the Lower Paleolithic occupation at Schöningen. Journal of Human Evolution 89, 46-56. ^ Oakley, K. P., Andrews, P., Keeley, L. H. u. Clark, J. D. 1977: A reappraisal of the Clacton spearpoint. Proceedings of the Prehistoric Society 43, S. 13–30. ^ Freemann L.G. & Butzer K.W. 1966: The Acheulean Station of Torralba (Spain): A Progress Report in: Quaternaria 8: S. 9-22. ^ Thieme H. & Veil S. 1985: Neue Untersuchungen zum eemzeitlichen Elefanten-Jagdplatz Lehringen, Ldkr. Verden. in: Die Kunde 36, S. 11–58. Wikimedia Commons has media related to Schöninger Speere. (in German) Projekt Schöningen Lower Saxony State Service for Cultural Heritage (NLD).